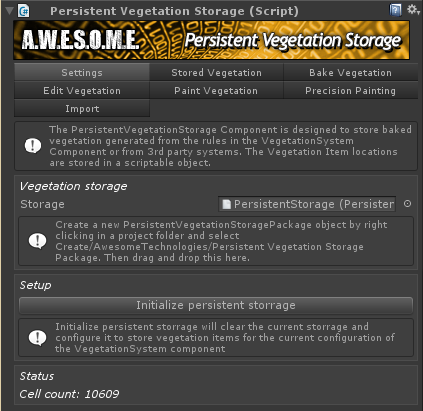 The persistent vegetation storage component is designed to handle and store persistent vegetation instances for a terrain. It uses a Persistent Vegetation Storage Package to store this information. The package is a scriptable object that serializes to the project. The storage has included painting tools, a bake system that can bake run-time spawned rules to the storage. In addition to this there is a importer system that imports from the terrain and scene and a API for 3rd party tools to integrate. Due to the amount of features in this component the documentation is divided on several pages. The importers are made using an interface. It is possible to create new that register in the UI.